This page will walk through Angular HttpClient.get example. HttpClient has been introduced in Angular 4.3 version. HttpClient is smaller, easier and more powerful library for making HTTP requests. To use HttpClient we need to import HttpClientModule in our application module and then we can inject HttpClient in our components or services. HttpClient has methods such as get, post, delete, put etc. We will discuss here get method. HttpClient.get constructs an Observable with configured GET request and when the Observable instance is subscribed, GET request is executed on the server. Here on this page we will provide the use of HttpClient.get in detail with error handling. For Web Service test URL we will use Angular In-Memory Web API. Now find the complete example step by step. HttpClient serves the purpose to perform HTTP requests. HttpClient is injectable class. To perform http GET request, HttpClient provides HttpClient.get method that accepts URL and options for parameter, header etc and returns an Observable instance. When we subscribe Observable then GET request is executed on the server. Find the syntax of HttpClient.get from Angular doc. We can see that HttpClient.get accepts URL and other options such as parameter, headers etc. HttpClient.get has following options to request http GET method. headers: It is of HttpHeaders types. It sets headers for the http GET request. observe: It defines whether we want complete response or body only or events only. We need to assign values for observe property such as response for complete response, body for response with body and events for response with events. params: It is of HttpParams type. It sets parameters in URL for http GET request. reportProgress: It is of boolean type. It is useful when we are requesting blob data. Setting reportProgress value as true we can know progress report for our HttpClient.get request. responseType: It is used to define response type of HttpClient.get request. Its values can be arraybuffer, blob, json and text. withCredentials: It is of boolean type. If the value is true then HttpClient.get will request data with credentials. The response type of HttpClient.get is Observable i.e. provided by RxJS library. Observable is a representation of any set of values over any amount of time. To use HttpClient we need to import HttpClientModule in our application module. Find the code snippet. Now we can inject HttpClient in our components or services. We inject HttpClient using constructor into our component or service. HttpClient is imported from @angular/common/http library as following. Find the constructor to inject HttpClient. Now we are ready to call HttpClient methods using http instance. For example, find the code below. Find the sample JSON data. Suppose we have following URL to access the JSON data. Now we can access JSON using HttpClient.get as following. If response type is JSON then using responseType: 'json' is optional we can also write it as following. Now subscribe to instance of Observable for actual hit of request to server and get response. If we want Typechecking of response then we can do it by using type parameter. Suppose we have following interfaces. We can tell the HttpClient.get to return response as Writer. Find the code snippet. When we use http.get<Writer>(...) then it returns the instance of Observable<Writer> type. Now subscribe to Observable<Writer> to get instance of Writer. Display data in HTML template as following. HttpClient.get returns instance of Observable. To display this data either we can subscribe to Observable or we can use async pipe with Observable. We have already provided sample code above to display data by subscribing Observable. Here find the code to display data using async pipe. Suppose we have following JSON data. 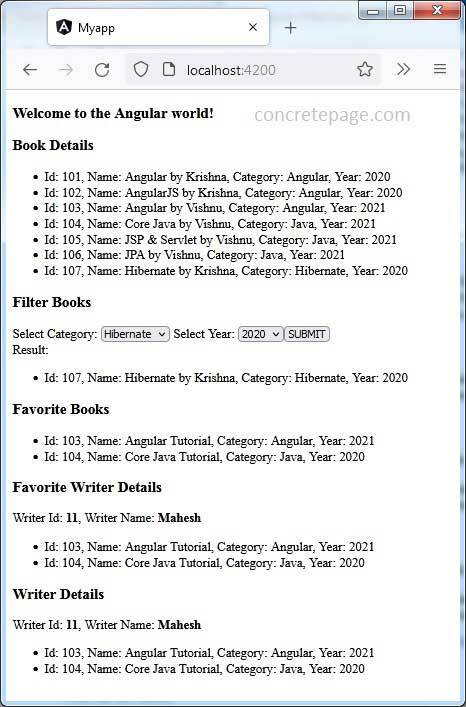 The JSON data is of Book array type. We will provide type parameter as Book. Now find the code for HttpClient.get. Now access the method and assign the value to Observable property. Use async pipe to display data in HTML template. To access text data using HttpClient.get we need to use responseType: 'text'. Suppose we have following text. Welcome to the Angular world! Find the URL to access the above text. Now use HttpClient.get with responseType: 'text' as following. To display data, we can use either async pipe with Observable or we can subscribe it to get text data. Find the sample example. Observable instance i.e. obsTextMsg can directly be displayed on HTML template using async pipe as following. Angular provides HttpParams class to use parameters and it provides HttpHeaders class to use headers with HttpClient.get request. Both HttpParams and HttpHeaders classes are immutable and imported from @angular/common/http library. Both have methods such as set and append. set constructs a new body with a new value and append constructs a new body with an appended value. We will import HttpParams and HttpHeaders as following. Now find sample example to use HttpParams and HttpHeaders with HttpClient.get request. observe : 'response' for complete response. observe : 'body' for response with body. observe : 'events' for response with events. Suppose we want complete response of our request then we will use observe property with HttpClient.get as following. HttpResponse is from @angular/common/http library. Now we will fetch body as well as headers of the response as following. To handle error, Angular provides HttpErrorResponse class from @angular/common/http library. HttpErrorResponse contains useful information regarding error. The second parameter in subscribe() is for error. We can log error as following. HttpClient.get can face two types of errors. a. If backend returns unsuccessful response codes such as 404, 500 etc then HttpClient.get will throw error with backend response code. b. If something goes wrong client-side, for example, an exception is thrown by RxJS operators or if network error prevents the request from completing successfully then actual Error object is thrown by HttpClient.get. Some errors can be handled by just retrying request such as if errors are transient and unlikely to repeat. For example if we have slow network error and our request could not become successful then there are the chances to make request successful if request is retried. To retry request automatically RxJS provides retry() operator that is called on Observable. retry() operator accepts number argument, suppose we pass argument as retry(3) then the request will be retried for 3 times. retry() is imported from RxJS as following. Find the sample example to use retry(). To test application we need Web Service URL. Angular provides In-Memory Web API that will provide Web Service URL. We can configure URLs with dummy data using In-Memory Web API. Find the steps to use Angular In-Memory Web API. 1. Open the command prompt and navigate to the directory where package.json resides and run following command. We will get following Web Service URLs.